My 18 month-old is fascinated by the moon and stars. Every night he asks to be taken outside, and if the moon is visible he breaks into a gleeful smile and calls out “Moon! Moon!” He also loves our two dogs, looking for them each morning as soon as he gets up. A deep impulse compels us to the lure of the heavens, and to our primal relationship with animals. I have seen the night sky while backpacking in the mountains, where the innumerability of the stars is enveloping and overwhelming – infinity made palpable. There is a related sensation in living with animals: after ten years my dogs are my family, yet there are moments when I look at them moving through the living room and see beasts as foreign as another galaxy. I can run my hand through the fur of the unknown. Demetrius Oliver has investigated the celestial urge for much of his career, and digs in once again for his current exhibit at The Print Center, Canicular, a word indicating relationship to dogs or to Sirius the Dog Star. Materially, the show is spare and, I suspect, intentionally underwhelming. 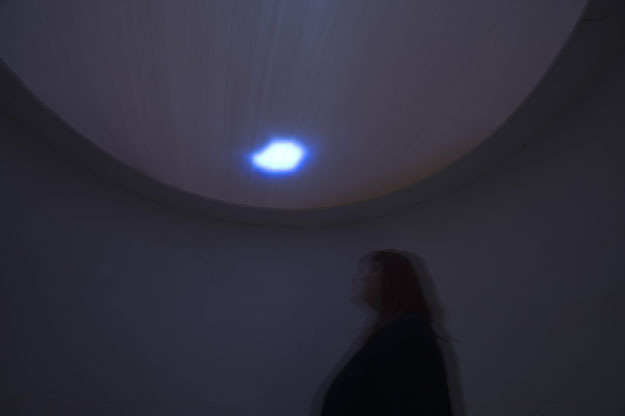 The first floor holds a faux heliometer (used to measure the sun) made of over forty stacked white plastic paint buckets containing a small projection of the sun’s reflection on Oliver’s studio floor. 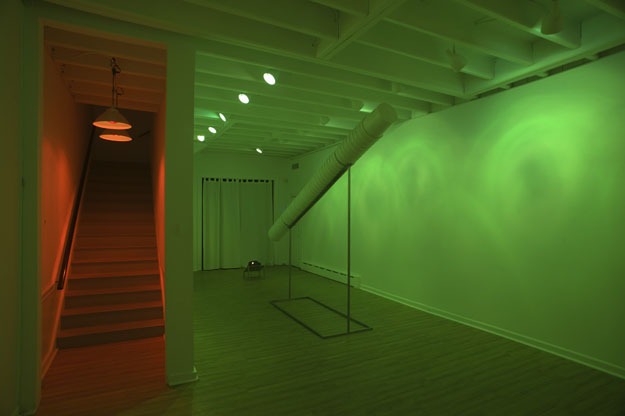 The gallery on the Print Center’s ground level is lit green while the stairway is lit red, signaling canine color-blindness. 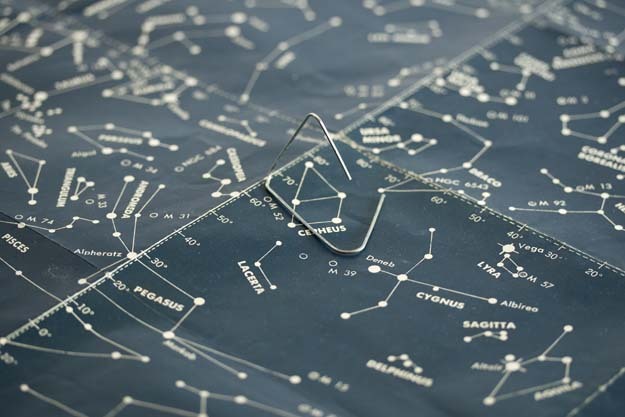 At the top of the stairs hangs a single photograph of what looks like an unbent paper clip placed atop the constellation Cepheus on a star map. 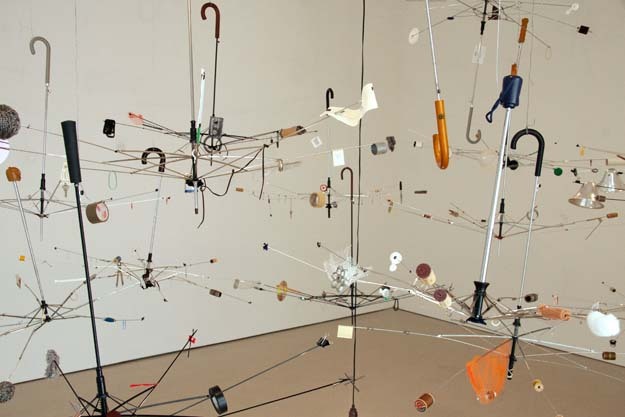 A series of videos lines a wall of the back gallery, slowly panning through and around his 2011 installation, Orrery, in which he created a celestial model using stripped umbrella frames, with odds and ends from his home and studio attached to their metal ribs. Finally there is an observatory chamber made with only a slight nod to outward elegance. Entering this makeshift space on your hands and knees through a dog door allows you to see an image of the star Sirius projected live from the Franklin Institute’s telescope onto a scrim suspended a few feet overhead. The Dog Star seemingly floating within reach is striking, and also notable is the faded pool of light that passes through the scrim to appear on the floor. Compared to what a star truly is, the faintly illuminated circle near my feet was an excellent demonstration of how little of Sirius reaches us here on earth. But I think the most visually rewarding moment is actually outside. Mounted above the entrance to The Print Center is a circular sign that lights up when the show is open. The sign presents a close-up of dog hair that at first glance resembles a photograph of a distant planet. 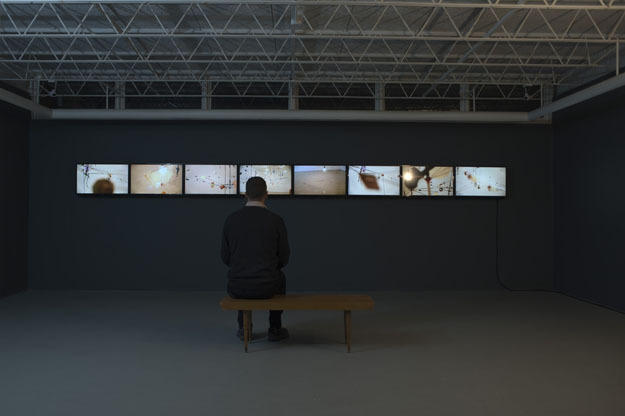 Looking at it I simultaneously saw fur and a swirling dust storm on an alien world, making for a captivating image that binds the dual foci of the exhibit, Sirius the Dog Star and actual dogs on earth. Oliver’s circular beacon also broadcasts music that he composed and performed on a dog-whistle, beyond the range most people can hear. The dog-whistle expresses a central theme in Canicular: our limited understanding of other natural phenomena, be they stars or the inner lives of dogs. The exhibition notes tell us the whistle-song is playing, but we do not hear it. Oliver did not install his Orrery at The Print Center, but presents video footage instead. Video is a sort of print and therefore in keeping with this venue, but feels somewhat dilute in this case. Sirius on the scrim is a complicated experience – on the one hand it is simply a spot of white light. On the other hand, we know we are looking at a live feed from a high-powered telescope trained on the brightest star in our sky. The night I visited, the star appeared to flare and burn. It turns out this was an interference effect of humidity and pollution, and that too is something to ponder. Oliver seems to suggest that mediation is our only approach to the sublime in nature. The Dog Star is wondrous when viewed directly in the night sky, but how many urbanites in 2014 even know this star or can point it out? Today, we are more apt to view the cosmos on our computer screens, through images from the Hubble Telescope or the Mars Rover. Our laptops and televisions expand our vision but have a deadening effect on awe. We approach cosmological knowledge from a remove, and I wonder if the reason Oliver placed the bent metal in his photograph on Cepheus rather than Canis Major (the constellation which contains Sirius) is because Cepheus contains a “variable star”, a subclass sometimes named for Beta Canis Majoris, which rises before Sirius at night. Beta Canis Majoris is a harbinger of the Dog Star, one step away. Unlike many artists today who present simulacra as an academic commentary on alienation, Oliver’s take is the opposite, more akin to Ralph Waldo Emerson’s transcendentalism. 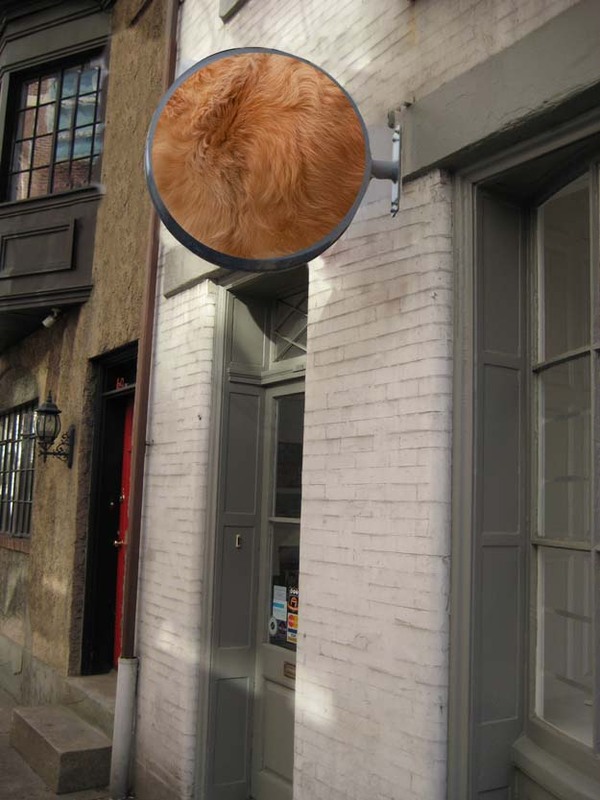 Like Emerson, Oliver has long been concerned with our relationship to the rest of the universe, for example in Jupiter, his public art on New York’s Highline in 2010, or his exhibit Observatory at D’Amelio Terras in 2002. In both cases he created photographs that unite our terrestrial existence to the planets and to the act of looking itself. Looking has been the foundation of both astronomy and art for most of history and remains a key means of discovery despite current technologies, suggesting an interesting alliance between science, art, and aesthetic knowledge in general. In his essay The Over-soul, Emerson wrote, “We see the world piece by piece, as the sun, the moon, the animal, the tree; but the whole, of which these are shining parts, is the soul.” [italics added] Using various mediating approaches, Oliver unites the animal and the celestial and asks if we can find the sublime in the sun’s reflection on the floor. While the photographs in Jupiter and Observatory had great aesthetic power, Oliver largely eschews beauty in Canicular. The exhibition has conceptual authority, but what it offers the senses is attenuated to the point that it makes for a mixed experience. That may be part of Oliver’s point. Canicular pushes back against grandiosity and entitlement: we cannot hear the dog-whistle, we do not really experience his orrery, we must crawl into his observatory, and the entire exhibition is open only for an hour per day, and then only if weather conditions permit the telescope an adequate view of Sirius. Nature confronts us with the boundaries of human knowledge and power while calling us to push further into these frontiers. Over centuries, our potential knowledge as a species is infinite. But in a single era or lifetime, what we can know is restricted. With Canicular, Oliver’s gambit is the materialization of these possibilities and limits. 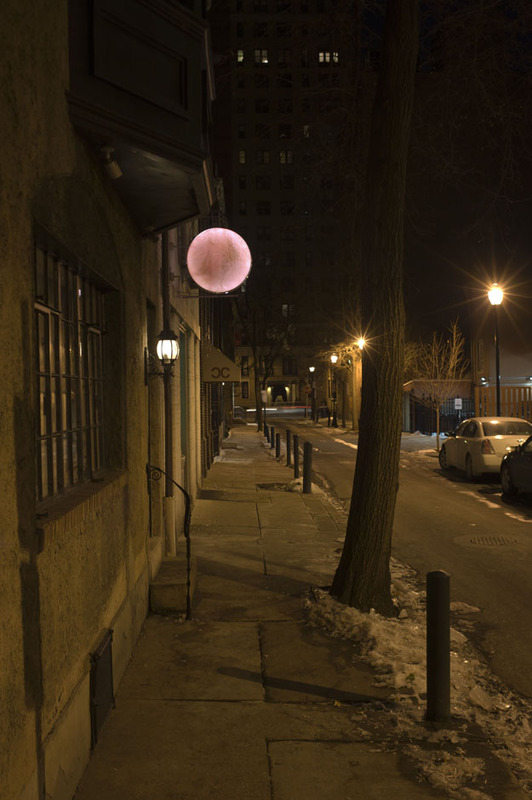 Daniel Gerwin is a painter living in Philadelphia. His solo show, Second Chances, is on exhibit at Abington Art Center from February through March 2014. He is a participant in the Art Writing Workshop sponsored by the International Art Critics Association/USA Section and Creative Capital/Warhol Foundation.